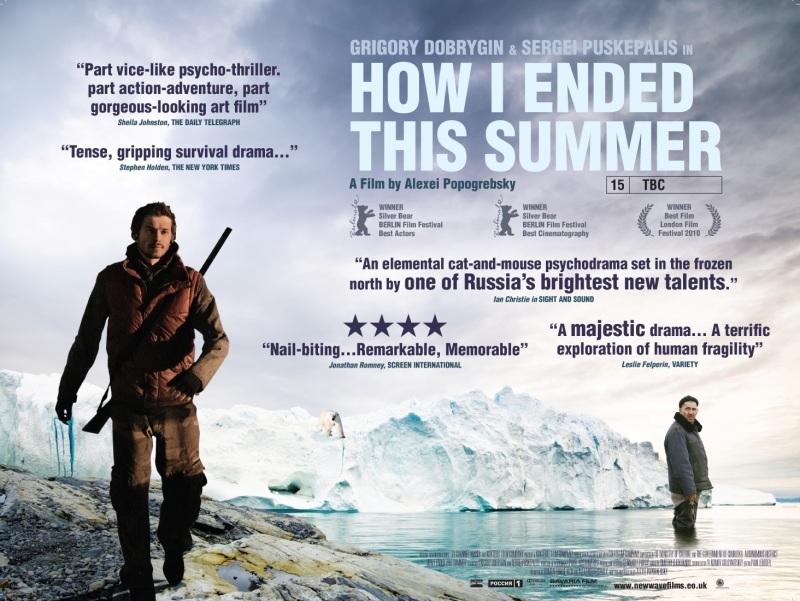 Russian director Alexei Popogrebsky’s prize-winning film ‘How I Ended This Summer’ is a story set in a place that is certainly not godforsaken, bequeathed as it has been with a great deal of nature’s majesty. But certainly it is one forsaken by human beings, and to some extent by the employer, the Russian state, for whom the men stationed there to work perform their jobs. There are only two of them, the older man Sergei and the younger man Pavel. They do their work at a weather station on an island off the far northern tip of Russia in the Arctic. The work consists mostly of taking and recording measurements with a variety of weather instruments, and reporting them by radio. Half the job though is staying alive and as sane as possible, doing whatever maintenance to the premises is required in such a remote place. Their living quarters are fairly claustrophobic, and if not squalid, then at least rundown. Outside however, nature’s presence is powerful, magnificent, endless and often beautiful. In addition to this abrupt juxtaposition and its attendant ironies, there is another, the old, antiquated communication equipment used by the older man to make contact with the distant base under whose supervision the two work, and the laptop used by the younger man for recording weather data or playing video games, and the mobile device on which he listens to music under his headphones. Amusement for the older man is fishing for trout in a wooden motorboat in the Arctic Sea. Observing the daily routines of the two men in their peculiar and extreme work environment is fascinating in and of itself. The interaction of the two disparate personalities with their vast differences of age and experience and predilection cooped up together most of the day and night has its own built-in intrigue of course. But then something happens far away, a family tragedy, and how it is handled, or more accurately isn’t handled, transforms the situation and the story into something altogether different, and shall we say livelier. What the film has to say about the Russian past and present, or doesn’t say, is certainly open to interpretation in the best sense. If one is looking for allegory about the demise of a Soviet empire, powerful, proud and fearsome, often held together by staples and masking tape, and its successor, a Russia unevenly tended to, to put it a certain way, and finding its path uncertainly, even bumptiously, one may find what one is looking for. However much the allegorical is or isn’t intended, or is or isn’t evident to any given viewer, it can be claimed with a great degree of confidence this a film with ample cinematic pleasures, with or without it. Indeed, it’s a delightfully disorienting experience, not through cinematic trickery, but with skillfully breathtaking cinematography, compelling storytelling and superb acting (both actors won several best actor awards). It’s a drama, a thriller, and a study of human behavior, often beautiful, edge of the seat tense at times, always fascinating. The film may speak to you about the big themes of change, adaption, order, sanity, obligation, history and legacy. If not, it will definitely speak to you about survival in the Arctic circle in close, half-dilapidated quarters, the perils of meteorology in rugged climes, the challenges to sanity posed by isolation, and the unexpected, surprising weirdness let loose as the result of the mysterious idiosyncrasies of human behavior. And it’s setting is absolutely stunning. Director Lawrence Kasdan’s oeuvre contains some of the most talked about American movies of the last several decades, among them: The Big Chill, Body Heat, Grand Canyon, Silverado and The Body Guard. 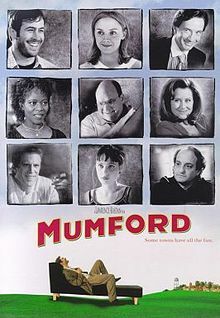 One less talked about, in fact only rarely whispered of is 1999’s Mumford. It is the uncharacteristic miniature in Kasdan’s body of work, his other films further down the commercially ambitious, high concept end of the spectrum. Though the film did skimpy business, it is in my view a gem artistically, and worth taking a look at for those in the mood for the intelligently offbeat and refreshingly original. The basics of the story are these: a young psychologist, whose last name happens to be the same as the name of the town, though new to the area, has quickly become a patient favorite, drawing patients from the town’s two established psychology practices. Quaint as the town may be, it is no less rife with modernity’s common and some less common manifestations of neurosis than elsewhere, and Dr. Mumford is clearly an especially good listener, empathizer, counselor and practitioner of therapy. Not coincidental to a story felicitously working the perennial theme of finding true happiness, and made during the Nineties “dot com boom” the story takes place in a company town, where the company happens to be a colossus in the modem market, and the wunderkind modem developer/nouveau riche owner is atypically vulnerable and down to earth, confidently gifted though he may be. I particularly like the way the darker flipside of the search for happiness: the strong imperative to ease or escape pain, is prominently incorporated into the story. Kasdan started out as a writer, selling screenplays to Steven Spielberg and collaborating on Raiders of the Lost Ark and other heavy hitters before he began directing. And it’s the writing here that stands out, a smart, sly, wry, but still soulful screenplay that tempers its irony with a perfect mix of humanity. The film gently skewers the psychologist profession, an easy target of course, but with something like good faith, never on the cheap. As fine as the writing is the acting is just as good or better. Included in the cast are several of America’s most reliable “actor’s actors”: Hope Davis, Alfre Woodard, Mary McConnell and Jane Adams. Loren Dean, as Dr. Mumford, is, as they say, a revelation, playing the low-key, highly personable man of mystery with just the right hints of mischievousness to indicate more beneath the surface and in the past. Along with Jason Lee, Zooey Deschanel, Ted Danson, Martin Short and David Paymer, these players, with limited screen time efficiently create characters who are fully realized and completely human, avoiding caricature, the common pitfall of quirky films with small town, colorful characters. This is very much NOT a film about naïfs or rubes. Kasdan treads lightly, though treads nevertheless on Big Themes like commitment, happiness, identity, normalcy, stigma and materialism, the need to be heard, the concomitant hope of being understood, but on a scale that’s approachable, and always with wit. Mumford remains light entertainment, but it’s emotionally engaging nevertheless, and for me a small (in the best sense) personal favorite. 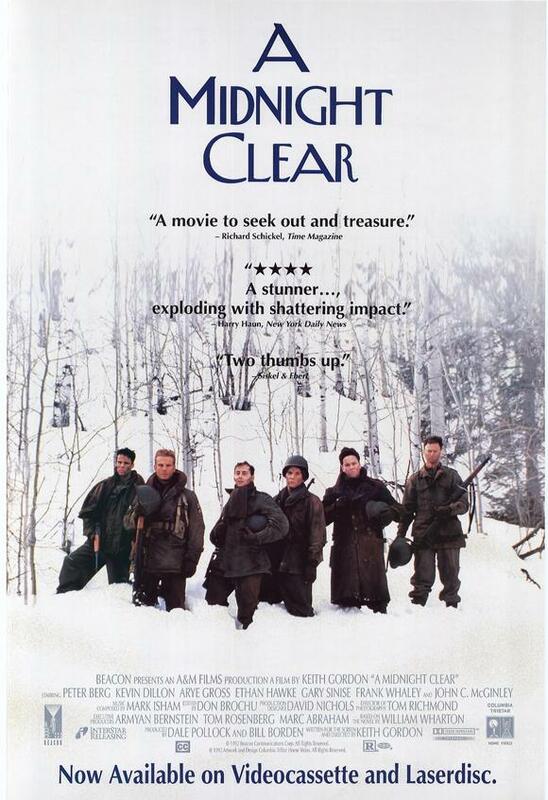 In director Keith Gordon’s 1992 film, A Midnight Clear, our awareness, and occasional evidence of the surrounding violence of war enhances the almost fairy tale aura that pervades the isolated beauty of a remote part of the Ardennes during the second World War. As much parable as war film, the characters are anything but traditional warriors, a young group of very intelligent reconnaissance soldiers, and their counterparts, some weary and desperate German soldiers. Unmistakably a commentary on war, it is also a highly literate exploration of its own insular, fictional world, the insularity provided by heavy December snow, and the isolation of the chateau where the Americans have taken shelter, and from which headquarters they are to accomplish their mission. The small group of beleaguered Germans soldiers sheltered nearby are hoping to surrender, though they worry about future repercussions for doing so from their own side if the Germans win the war, and furthermore, they must approach the Americans very carefully indeed under the circumstances. It’s a very simple story. The complexity is in the relationships of the Americans to one another and to the Germans as well, and in the at times comic, at times poignant, and always ingenious dance the Germans and Americans find themselves engaged in. But how the story plays out will surprise you, and do so with an impact that is unanticipated. With superb performances by Ethan Hawke, Gary Sinise and Kevin Dillon A Midnight Clear is a beauty. Television arguably has dealt more powerfully and realistically with the perils of compulsively getting high than film, specifically in two signature series from writer-producer David Simon, both set in Baltimore: The Wire and The Corner. Film has addressed addiction with varying levels of success in films such as Lost Weekend, Days of Wine and Roses, Man with the Golden Arm Panic in Needle Park, Drugstore Cowboy and Requiem for a Dream (Derived from the Hubert Selby novel). Frankly, in the Baron’s not particularly humble opinion, any film on the subject that fails to convey the enjoyment of catching a buzz, in particular the social ease and enhanced conviviality that comes along with a good high, as well as the inevitable dark side that envelops those prone to real addiction isn’t really doing right by its subject matter. 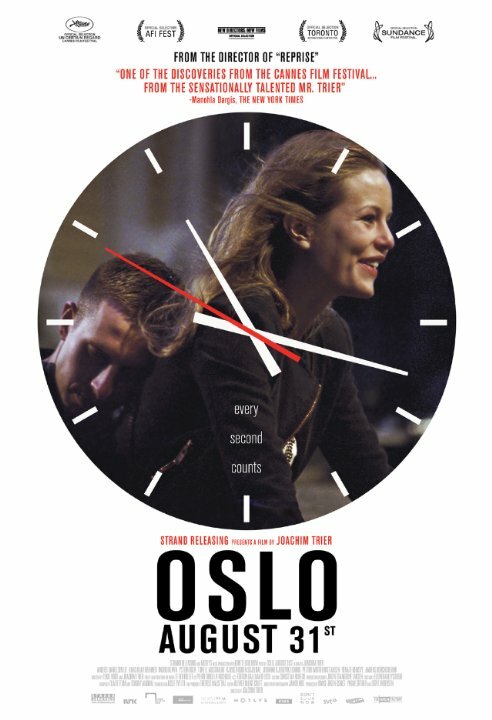 For those appreciative of the subtlety, inventiveness and depth more readily available in films from abroad (indeed, much more available), a full-bodied depiction of a life deeply affected, if not largely defined by a history of drug use, is the Norwegian film from director Joachim Trier, “Oslo, August 31st”. Essentially a day in the life of Anders, out for the day from the rehab clinic for a job interview, as well as reconnecting with family and friends, it is a film about drug use in which relatively little screen time is given over to the actual depiction of the use of drugs. It’s a film more beautifully, and at times harshly ruminative than the subject matter could lead one to expect, one for whom matters such as social, cultural and economic expectations, identity, norms and individuality are just as central as the protagonist’s personal demons. Likewise disconnection, disruption and the need to lead a productive life add nuance, richness and complexity to Anders’ odyssey. Maybe best of all, the film offers the freshness for American audiences of a tour through the days and nights of contemporary Oslo. Available on DVD and Amazon Prime. The Week’s Baron Von Compos Mentis Picky Pick: In the same vein (oops) as Oslo, August 31st, those who have not seen the Gus Van Sant flick Drugstore Cowboy owe it to themselves to finally catch it. Besides being droll, dark, comic and spot on, it’s worth the price of admission for the presence of iconic Beat, William Burroughs.